Day 17: Drive back to Leh. 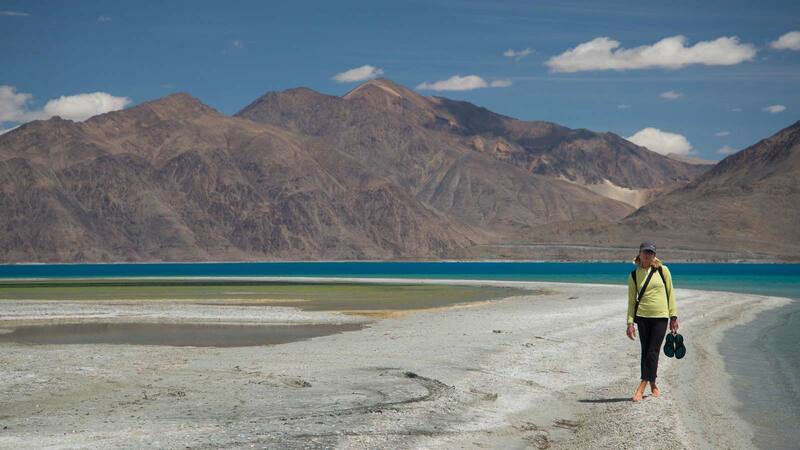 The journey would begin from Leh, where you would be leaving for Lamayuru in the morning via taxi. 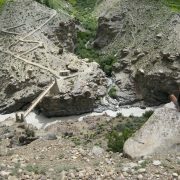 The path would follow along the river Indus and enters the Sham Valley. Once you have explored the Lamayuru monastery, you would be packing your backpacks and making it out for the day 1 of the adventure. 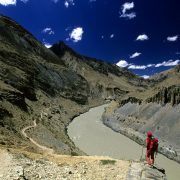 You would begin by following a little stream and then making a climb for the Prinkti La pass that is around 3,700-m high. Then, you would be making it through the Shilla village (3,700 meters) before coming to Wanla at 3,250 meters where the campsite is located. Explore the area, enjoy sunbathing and check the nearest monastery. On day 2, you would be taking a dusty road that would help you end up in the Phenjilla village that is around 3,400 meters and parts of the village Ursi. Then, we would be trekking into a small gorge that would bring everyone to an out of the world building, a flourmill known as Rangthak in traditional language. Then, the trek would enter the Hinju village at a height of 3,700 meters that is around 2 km under the campsite. On day 3, you would continue the journey from the encampment to climb the ridge at the foot of the Kongskil La, which is around 4,900 meters high. Once you are here, you may also be able to view some local wildlife. Here, you can enjoy the spectacular views of the high Stok and Karakoram ranges. You would then come to a steep descent that features loose soil that is difficult to tackle. Then, the trail would take the left side of the valley and come to a stunning hut owned by yak herders at a height of 4,500 meters. This is near the campsite and it is inhabited by the people of Sumda Chenmo village. You would be taking a short walk early morning and cross streams a number of times before reaching the main part of the Sumda Chenmo village. Thence, you would be making to the left of the valley that would give you a stunning view of the village. Then, the path takes you through the thick growth of wild roses in the valleybefore coming to the next river crossing that originates in the snow-covered Photoksar that is around 5,680 meters high. Once at this point and prior to beginning your steep climb for Lanak, you would come across some wild growth of Edelweiss and many other species of wild flowers. Once you reach the campsite, it would become possible to get amazing views of Konskila. The day 5 of the Lamayuru and Rupsho tour begins with an ascent for the Dungdun Chan La, which is around 4,800 meters high. From here, a glimpse to the east would give you the view of the Stok Range and a view towards the south would give you the Zanskar Range. Once into the pass, you would get down the ridge and enter the valley before coming to the Chilling village. Spend the day 6 restingin the village of Chilling. It is the sole Ladakhi village where metalwork is carried out around copper, iron, silver, tin and bronze. You can walk around and get a glimpse of the local lifestyle. The night would also be spent here. Once have had your breakfast in Chilling, you would be beginning your climb for Skiu. 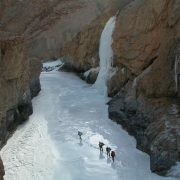 It is around a 2-hour trek that would give you amazing views of the Stok and Zanskar mountain ranges. You would be able to explore the valley better when you cross the Zanskar River on a trolley. In addition, there is the local wildlife to be explored including the Marmots and the Blue Sheep. Once you have a briefresting period, you would be ending the day via a hike into the beautiful gorgeprior to setting up your camp in Skiu. An ancient monastery can be found in this beautiful village and you can also explore the old and ruined castle where the royal family once used to stop during their journey to Srinagar. You would be moving along the Markha River and hike into the beautiful valley that can be reached through a relatively plain trek. The trail would cross at multiple points and pass throughthe winter settlement including Lhatos and Mani walls. A large number of tea houses would be open during the hot tourist season. Visiting during this time of the year would give you a chance to enjoy some thrilling refreshments. Once you have crossed the river one more time, you would find yourself in Markha, which is ht valleys largest villagehaving over 2 dozen houses, a broken-down fort and an ancient monastery. The day 9 of the trek would take you through the Markha valley to the beautiful Techa monastery. It is ideally located atop the beautiful cliff that overhangs the valley. The pathway would interconnect the river many times before reaching the last few houses across the valley. Once you leave the Umlung village, you would be able to enjoy the first glimpse of the Kang Yatse that is around 6,400 meters high. It would remain in your view until you reach Kongmaru La. Once you reach the Hangkar village, which is the last village in the valley it would be time for lunch. The camping ground would be beyond this valley in Thachungste that features beautiful green pastures. The tiring walk from the previous day, you would find it easier to walk across the distant Langthang valley. 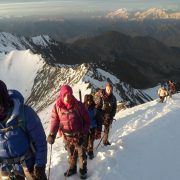 This part of the Lamayuru to Rupsho tour would take you to uncharted territories that are untouched by most trekkers. In fact, it is only the Markha villagers that come here to graze their cattle. In Thachungtse, you would be moving down the valley until it breaks and crosses over the river. Then you would be following the valley to its left and follow the Langthang Chu River. If you look to the right, the path down would take you into Markha. The river of Langthang would rise during daytime because of the melting snow and by afternoon, it can become almost impossible to cross. Therefore, it is important that you begin this day early in the morning. Once in Yakrupal, there is a beautiful green area for setting up the camp and enjoying meal, while watching the horses graze around. Leaving Yakrupal, you would be moving towards the Zalung Karpo La pass. Once on top of the pass, looking to one side you can views the Zanskar range and on the other side the Chang Tang Plateau, the worlds highest plateau that extends into Tibet. As the pathway proceeds, it would descend steeply and cross many rivers taking you to the elegant and green campsite in Khar. The night would be spent here. The name Kharnak stands for Black Castle in local language and it is located atop a hill that is overhanging your campsite. Khar had a palace in the past that was the residence of Kharnaks king. You can explore the ruins of this kingdom, while according to local legend it is haunted. It is also believed that the nomads living in Dat have descended from the people of Khar before moving to Dat. The day 12 is a more relaxed day of the tour that would involve walking throughlush green and wide valleys. The valley would divide at Tangtse Sumdo, with the left opening taking you to Dat and the right one into Zanskar. The second trek passes through Zhunglam and as it offers more than 80 crossings across the river, you are bound to get wet up to the knees. While passing through the pass, you would come across many nomadic campsbefore coming to the Dat village. Here, there are many stone hut settlements and it is also the winter home of the Kharnak nomads. The nomads come here between October and December, and then between March and June. The exciting thing about the Kharnak nomads is that they are pleasant and colorful people that move along with their pashmina goats and yaks. Dat has a monasteryand the Dats come back here every couple of day for lighting the candle. Once in Dat, you would be entering the wider landscape of the plateau of Changthangand take to the wide and long valley before moving into another side valley of Yar La. During the spring season, the nomadic locals would take all the animals into Zara. You would be amazed to see more than 30 families taking their yaks along in caravans. This side valley gives an easy access into the pass. Here, you would be able to reach the Lungmo Che pastures after a short walk. This is where you would be resting for the night amid the beautiful and cold snow-capped ranges, colored sky and yaks. On day 14, you would take the trail for the beautiful lush hills of Yagang. This is also a settlement dotted with many stone huts of the Kharnaks. Zara is the summer camp of the Kharnak nomads and a jeep road from here heads in that direction. Once you check out this place, cups of butter tea would be waiting at the village. It is also possible that the nomads can invite you into their black tents. You would be cross Leh Manali highway road and after few hour you will reach to tsokar lake. 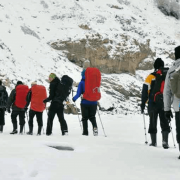 The day 16 would be spent trekking around and hiking the area around the Tsokar Lake and have a chance to see Black nacked crane,wild asses and so on…. You would be driven to Leh by car. On the way you will cross the Puga there you can enjoy the hot spring water etc, .